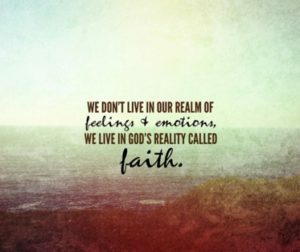 As mature Christians we are told we aren’t to rely on feelings to know God is with us. If that is the case, I must not be a very mature Christian because I sure like the feel of God! One glance up into the clear blue sky, or a stop at the beach to take in the crashing waves of the majestic Pacific, or one look into the faces of my kids erases all doubts that there is a God and He is with me! The sight of my two precious and comical little dachshunds not only tells me there is a God, but that He has a sense of humor, too! What do we do in the times of drought of feelings? The older I get the more I realize we do the same thing we do with just about everything in life: We choose to step out in faith, in spite of how we feel, knowing – in time – the feelings will come. Most of us don’t relish getting out of bed when the alarm goes off. Yet, we force ourselves to in spite of our feelings. In a few minutes, we begin to feel differently; we are fully awake and ready to face the day ahead. We don’t feel like putting on the tennies and going for a walk. But, in spite of how we feel, we do it anyway. Ten minutes into it, we start to feel better. When we are done, we are glad we did it. You may not feel like going to the business function with your spouse. You override your feelings and choose to go anyway. Once you are there, you find you are actually enjoying the event. Feelings are fickle! Feelings are subject to change – we often have to prod them along to change! It is in the doing that the feelings come. Choose to live in faith, believing and knowing He is with you today. It will change the way you feel!